It's still very "buttoned" up (pun intended), but its been announced that Twitter is taking control of the retweeting functionality for its microblogging platform. Ever since Twitter has moved into a monetization mode, its either acquired or competed head-on with apps designed by third-party developers. Twitter is planning to launch its one-click sharing service this week. When it does, it looks like Tweetmeme may be on the outside looking in, unless there are some undisclosed acquisition plans that have not hit the digital airwaves as of yet. According to Ben Parr at Mashable, the social media news blog site has been unsuccessful in reaching out to Twitter for clarification on this annoucement. "The company that is most likely to be affected by this development is Tweetmeme, which powers most of the retweet buttons you see on Web sites and blogs across the Web," stated Parr. What has been determined is that the new Tweet Button will be a comprehensive counter of retweets across Twitter's site. It is a single line of code that can be added to any publishing Web site - and it comes in three versions (110×20, 55×20, 55×63) with five different settings for customization. Marc Chacksfield at Techradar thinks that Twitter will add some 'bells & whistles' to their button to make it more appealing for the Tweetmeme adopters to make the switch. Twitter will be "attaching a (user's) Twitter account to the button, different looks, default text (to) entice Web sites into using the official version," says Chacksfield. The introduction, code and some additional details pertaining to the new Tweet Button have been secured by Mashable and are listed here. The final slide provides explicit directions as to how to set up the new Twitter widget that includes Twitter's own URL shortener - t.co. Mashable is assuming that Twitter and Tweetmeme have had discussions and some kind of gentleman's agreement has been struck. My guess is that either an acquisition has taken place and the final terms of the negotiations are still be worked out - or Tweetmeme received some kind of pay-off to go off and develop other apps. 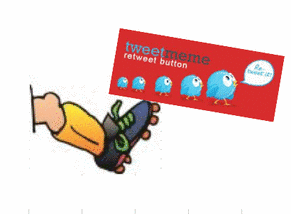 So the question is, would you trade in your Tweetmeme button for an official Twitter widget? Take our POLL and let us know how you weigh in on this topic? Will you trade in your Tweetmeme button for the Official Twitter button? Can Mold Make Robots Happy?